Lynn has an impeccable sense of design. She re-did our front yard, incorporating the elements that we wanted to stay such as a wall and some trees. It has been two years since the work was completed and our family continues to enjoy the wonderful changes she suggested and which were implemented by the landscape contractor. I highly recommend Lynn not only for her considerable skills but for her ability to stick with timelines and steadfastness in seeing the project through. I never hesitate to recommend her. Wolfstone Landscape Design took a weedy lot, with zero character, surrounding a 70's style rancher at the Coast, and created the favorite part of my home! The plans created included a beautiful wood fence, a patio made of recycled bricks from a local crosswalk, and flowerbeds surrounding the patio. The plan included trees and native plants that can survive our tough coastal weather. The landscape plan in the front yard greatly improved my "curb appeal", and neighbors compliment me regularly. Lynn Wolfstone is professional, friendly, has an artistic eye, is easy to work with. She submitted plans on time, and within budget. She was patient when I had my moments of indecision, and helped by offering several choices. I highly recommend Wolfstone Landscape Design, and will use them again if I ever decide to leave my little piece of paradise! 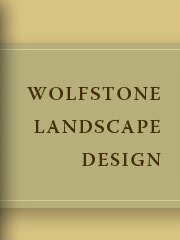 To read more reviews of Wolfstone Landscape Design at Houzz.com, click here.